This game-changing seminar will definitely alter your views about the Qur'an and the complexity of Arabic language. TESTIMONIAL 1: "Why has no one taught us this before?" What will bring you there? We have the answer. The question is: are you ready to receive it?! 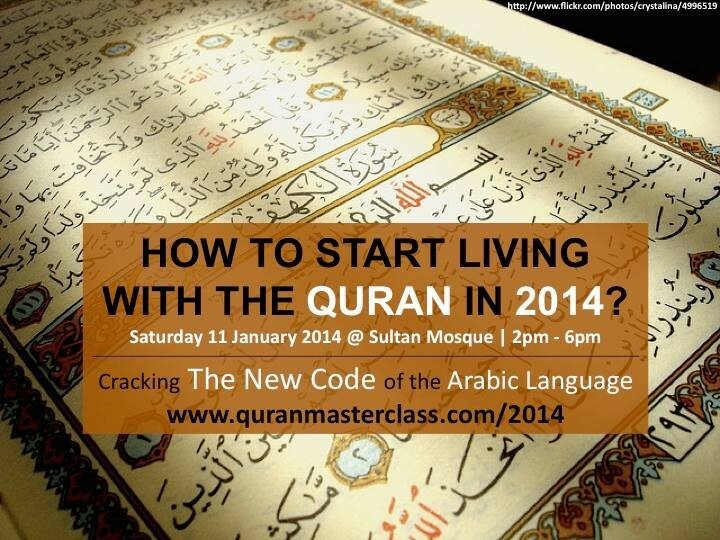 How To Start Living With the Qur'an in 2014? The New Code in understanding Arabic Language in under 60 minutes. How to understand the Qur'an via The New Code? TESTIMONIAL 2: "This makes it so easy. I've been waiting years for this"
If you are reading this paragraph, congratulations! Most don't go past the headlines. YOU are different. And I know you don't have much time; so, let's cut to the chase. We are the content development team of the Aspire Institute. We are super excited for this seminar. But let us be very frank from the start. You will NEVER be able to instantly understand Arabic language or the Arabic Qur'an by attending this seminar. However, you will definitely leave with a powerful proven simple framework to understand the Arabic language and therefore begin your Qur'anic journey on a happy footing, standing out from the other 98% of Arabic language learners who may not have access to the code. Okay, now that that's clarified, let's get to my background story. Have you ever found it difficult to understand the language of the Qur'an or even its translations? Most, including us, have "been there, done that". And we both very well know how frustrating it can get. Most will just put aside the Qur'an because of its seeming complexity; sounds familliar? You may wonder why God Himself says that He has simplified the Book for His servants to read it, and yet most have gone through much difficulty in comprehending it. From Ramadan to Ramadan, from one religious class to another, most struggle to find the X factor that serves as the bridge between us and understanding the Qur'an, simply and easily. We are now asking you to worry no more, as we have come to the conclusion that it is neither about the complexity of the Qur'an nor the Arabic language. Alhamdulillah, after we believe we have stumbled upon the code of understanding it. Yes, we broke the Arabic Language code. And yes, we believe you would be uber amazed before we can even finish explaining the code to you in under 45 minutes. Yes, merely 45 minutes. We know that's quite a bold statement. [1st Hour] A Simplified Way of Understanding The Qur'an. [2nd Hour] How To Apply The New Codes? [4th Hour] How To Teach It To Yourself And Others? TESTIMONIAL 3: "Senang ah, saya nak ajar mak saya"
If you are keen to know more, register early to avoid disappointment. The fees for this seminar is simply unbelievable. We are keeping it this affordable for this inaugural event to spread the priceless knowledge to as many people possible. This is your opportunity to join at this special price. Advance access to our latest online learning environment containing some of our latest not-yet released new videos (so that you can start your journey BEFORE 2014 begins). Privilege access to testdrive our premium online membership access right after the seminar. Do send an sms to 9777 9586/94762653 immediately after the transfer. Your seat will then be confirmed. We look forward to hearing from you soon.